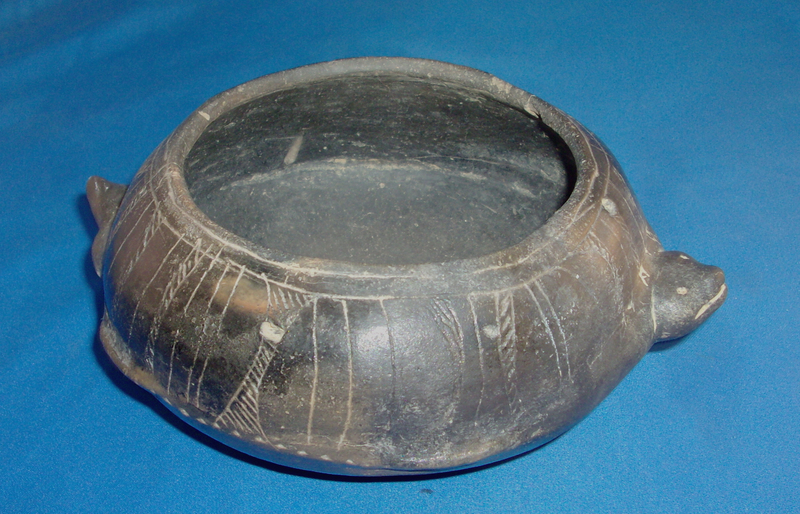 A Large Size, Rare, Very Well Made, Caddo Turtle Effigy Bowl That Exhibits Surface Sheen And Clay Aging Patination, Aged Open Pit Firing And Firemarking, Aged Bottom Use And Handle Wear, Visible Aged Surface Grog Deterioration, Aging In The Engraved Lines, Correct Material And Manufacture For The Area Found. Pictured In "Art Of The Ancient Caddo" Page 57, Fig. # 102. Ex-Dr. Kent Westbrook, Sam Johnson And Jack Bonds Collections! This Vessel Has Slight Restoration On Features! Includes a Ken Partain Certificate Of Authenticity!